Courses that meets your request is not found. Write on info@educationindex.ru or send your requestand our staff will help you choose the right language course. The British are very responsible attitude to the quality of their education — be it public or private school, University or language courses. We fully share these principles, so have gathered for you the guaranteed quality, the optimal intensity of training and the cost of the program of English language schools in the UK and England. All schools are accredited by the Accreditation UK scheme, which was developed and is managed by the Association of language schools EnglishUK in collaboration with the British Council, British Council. Accreditations of our language school is one of the mandatory requirements for obtaining a short-term student visa to the UK. Selection and booking for English language courses in the UK you can do it yourself is very easy and convenient. Choose the best option, search for the ideal accommodation, special offers and discounts. Book and pay for courses quickly, without leaving home. Where to learn English? Of course, in England! Language learning requires motivation, constant practice and improvement of skills. And where you can get it all to the maximum extent, not in a natural language environment — the home of English, England. Learning English in Britain will increase the level of motivation of an adult, which is outside the language environment it is very difficult to find time for regular classes and homework, to concentrate on the subject and implement the knowledge in daily practice. Will help in achieving these goals, accredited language schools and language courses in the UK. 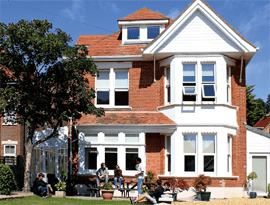 English language schools in the UK operate all year round including the summer months. Summer is vacation time and school holidays, and summer intensive courses of English in great Britain and England - a great opportunity to spend it with interest and benefit. Moreover, students can vary the workload by choosing the package with the required number of classes at a convenient time. Come to Britain to study English to can as be willing to learn English from scratch, and students with medium to advanced level who want to Polish their knowledge and speaking skills, to learn specific vocabulary, to prepare for entrance to University. English for adults - General language programs, which train all language skills: reading, writing, listening comprehension and special emphasis on conversational practice. English for business program for people who already speak English at a level not below Lower Intermediate (B1 on the European classification). 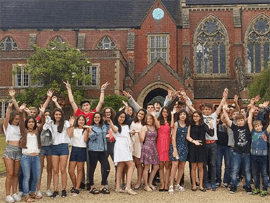 English for students-preparation for language certificates IELTS, TOEFL, entitling admission to universities in the UK, as well as for Cambridge ESOL exams. to study, work and life. In most cases, classes are held morning and afternoon and evening are free to prepare home tasks, excursions, entertainment and leisure. Of course, if you are interested in formal training, in England you can easily pick up a decent options. The total duration of the English courses in UK for adults varies from 1 week to several months. English schools sell training courses for weeks — thus, the student chooses how much time and money he is willing to dedicate to language learning. 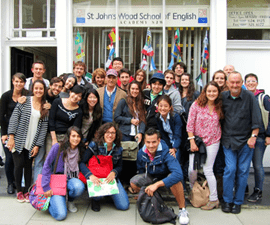 Students from Russia, Kazakhstan, Ukraine and Belarus are very popular two-week English course in the UK - including in the summer. Two weeks is the optimal time from the point of view of cost, the immersion, the opportunity to see the country, gain new knowledge, experience and relax. Standard English course in England, typically involves 20 hours per week. Intensive studies suggest that 25 hours a week or more. 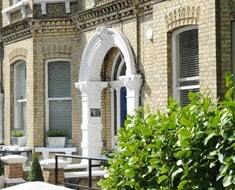 Accommodation in an English family is one of the most popular accommodation options. English language training in the UK with homestay provides a complete immersion in the environment, enhances communication skills, allows you to work out the obtained in class knowledge in real life and feel confident in a variety of everyday situations. 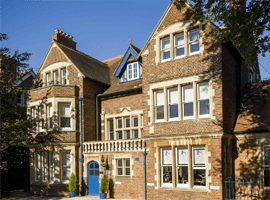 In addition, students can find in England English language courses with accommodation in a family of teachers — and this significantly increases the learning efficiency. If in a normal family your language mistakes can be ashamed to correct, what the teacher will do this naturally, without embarrassment, because his immediate task is to teach you. Thus, your classes are not limited by class. Such programs are referred to as Study & Live in your Teacher's Home. Hostel - perhaps the most economical option that works best for young people who go to the UK to learn English in the company of peers. In the big hostels don't give up the room entirely, and beds. As a rule, the hostel rooms are large and there are 6-10 of bunks - so good company and conversation you provided. 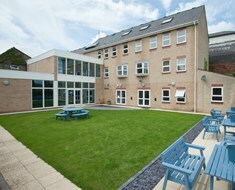 Accommodation in the hostel will cost an average of £25-45 a day. Apartment rental — another relatively economical option for students who travel to the UK to study English. Option is useful for those who want to live in the most free mode. You do not need to adapt to the rhythm of life of owners - as it inevitably will in the case of homestay. But remember: the apartments are without power, it will have to take care of yourself. Day the apartment will cost about £60 a day. The least cost option for accommodation is the hotel. A budget hotel will cost will cost from £70 per night. The amount which would be required to learn English in the UK depends on the duration and intensity of training, and also on the chosen option. 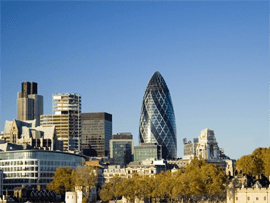 Business English mini group + individual, 30 lessons — from £1063. Also don't forget to budget the cost of food and transport from just £250 a week, tickets and visa. 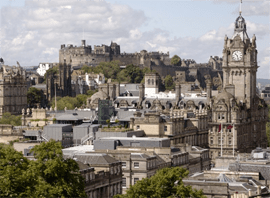 Most students who go to English language courses in the UK tend not only to improve your knowledge and conversational skills, but also to visit the sights, experience the local cuisine, walk through museums, pubs and shops. In this case, the cost will be quite different. To understand the amount of costs will help a pre-planned schedule and itinerary. Help in this program and travel apps — such as Google or Trips Triphobo. Is it possible to find English courses in England that are cheap? Just look at the exchange rate of the British pound, to understand what the UK is difficult to classify a “cheap” countries. And “inexpensive” is a relative term, it depends on what and with what to compare. But if we reformulate the question as “is it possible to save on the price of English language courses in the UK”, the answer is unequivocal: Yes! In the region of learning and living. So, tuition and accommodation in London and Edinburgh is the most expensive in Oxford - the price of English courses already cheaper by 10-15 per cent. Cheaper London to 20-25 % cost training in Central Scotland (except Edinburgh), and Wales, and the cheapest region is the North of Ireland. In addition, the price of housing varies according to the season. In high season, of course, will be more expensive. The cost of training. First, there is a natural difference in the cost of English language courses in the UK secondly, schools occasionally make deals. Cheapest English courses with a discount can cost from £ 165 without accommodation, food, flights, visas and other expenses. On food — cook your own meals is cheaper than dining in cafes and restaurants. Transport — find out about discounts for students, youth, travel tickets and other. On entrance tickets to the museums (some for students free admission). Of the many options learning English online and offline everyone chooses the one he likes and funds. But there are few people who would teach English, not wishing to go to England. Learning English language courses in the UK is a great way to make a useful, informative trip saturated with vivid emotions and interesting experiences. After returning from a trip home, you will still be able to share impressions. And by the way, to share personal experiences and write reviews of courses in English completed in great Britain, and English — so the outcome of your visit, the results of study in English language school and language progress will be immediately visible and will serve as a motivation to achieve a new level for you and others.